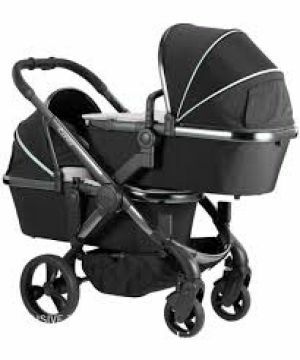 Now with over 60 modifications the New iCandy Peach offers superb style, functionality and versatility. Suitable from birth, the seat unit is now larger than previous generations, holding up to 25kg. The new iCandy Peach Carrycot has been constructed to appear clean and minimalistic while offering a warm and snug space for your precious little one to enjoy nap time. As baby grows out of the carrycot, the fabrics can be stripped away from the carrycot frame using an innovative "zip in, zip out"design, transforming the carrycot into the seat unit. The seat unit provides ample space for baby to grow. The adjustable calf support ensures baby is comfortable at all times while two handy storage pockets on the back of the seat unit keeps essentials close to hand. The four position recline can be adjusted using just one hand, whilst the brake is now purposefully located off centre, making it simple to access when using the pushchair in double mode. Ensuring smooth and bump free rides the Peach includes PU puncture proof tyres. The large canopy now features a peak and extendable panel. The mesh ventilation windows offers improved air circulation and temperature comfort. The extendable hood also offers extra shade for baby, thanks to the use of smartly placed magnets; which control how much of the canopy is exposed to the elements. This "smart vent"function helps ensure that the temperature for baby is always at the optimum level. An auto lock has been added the Peach, meaning the pushchair will lock automatically as it's folded. The swivel bumper bar is a simple but inspired addition. The shopping basket has been increased by 5kg, now holding a massive 10kg. What's more, an ingenious carry bag has been added to the basket, slotting seamlessly into the existing design, and then being removable for use as a satchel, ideal for emptying the basket and going to the shops.